A towering piece titled “Between Red” by painter Lee Se-hyun stands at the entrance of the “Old & New” exhibition at the Dongdaemun Design Plaza. The striking yet detailed oil on canvas painting portrays rows of crimson, rolling mountains and stacks of smoke. It is an homage to the Joseon-era artist Jeong Seon, frequently referred to by his pen name Gyeomjae, who was active in the mid-18th century and is renowned for his realistic representations of Korean landscapes. 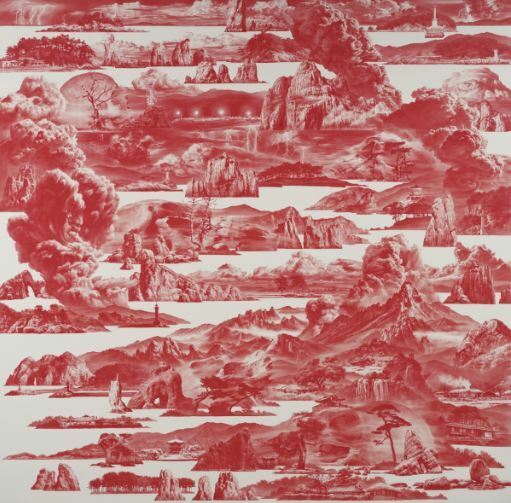 While the reference to traditional paintings is clear, Lee -- who last year collaborated with fashion brand Salvatore Ferragamo to create limited-edition scarves depicting his artwork -- was at the same time inspired by an infrared camera shot of the Demilitarized Zone between the two Koreas. The painting brings together the traditional landscape genre, the history of the Korean division and modern technology in a “dreamlike” piece, according to head curator Lee Jin-myoung of the Gansong Art and Culture Foundation, the exhibition’s organizer. 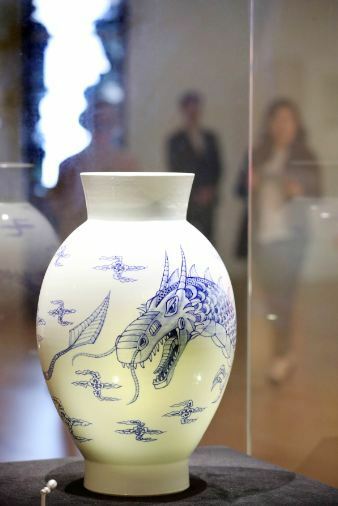 For “Old & New,” which runs from Sept. 10-Oct. 23, 33 modern artists each created new interpretations of some of the many priceless pieces owned by the Gansong Art Museum, Korea’s first private museum founded by famed art collector Jeon Hyeong-pil, whose pen name is Gansong. The exhibition pays tribute to Gansong who collected hundreds of important cultural assets during the Japanese occupation period and made great efforts to preserve Korea’s cultural heritage. He passed away in 1962. The purpose of the exhibition is to look back on Jeon’s philosophy of “strengthening the country through culture,” which still applies to this day, according to Jeon In-geon, the grandson of the museum founder and secretary-general of the foundation. “The reason works of art are valuable is because great works show us the culture and the age in the most honest and intelligent way,” reads a quote from Gansong printed on the wall near the exhibition’s entrance. “The Memory of Gansong” by artist Lee Chang-won uses mirrors to reflect negative images of Gansong and Jeong Seon’s “Mt. Geumgang view from Danbal pass” onto a wall, rendering the images positive. Through this distortion of images Lee seeks to explore what is “informative” and “authentic” in the modern world, he said. 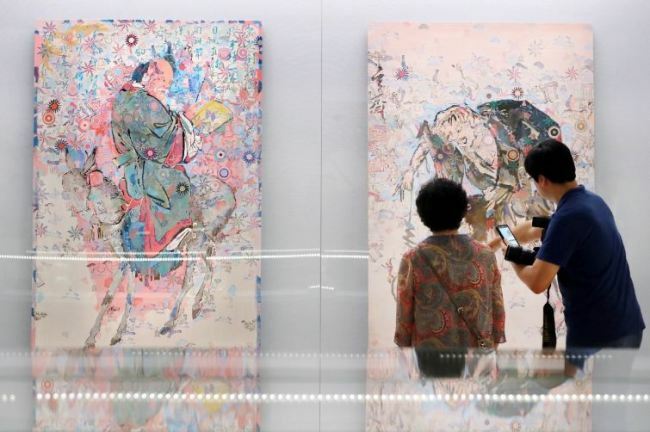 Artist Jang Woo-suk has reinterpreted two pieces of 18th century Korean ink wash paintings owned by the Gansong Art Museum -- genre painter Danwon Kim Hong-do’s “Old Man Rides Backwards” and “Liu Hai Playing Alone” by Hyeonjae Shim Sa-jeong, a protege of Gyeomjae -- into vibrant pieces of light colors on silk. Like the two 18th century paintings that depict noble figures, Jang wanted to depict the heroism of Gansong in a contemporary style, he explained.